Belle has been selected as 1 of 5 artists chosen to submit a proposal for the She Built NYC initiative. 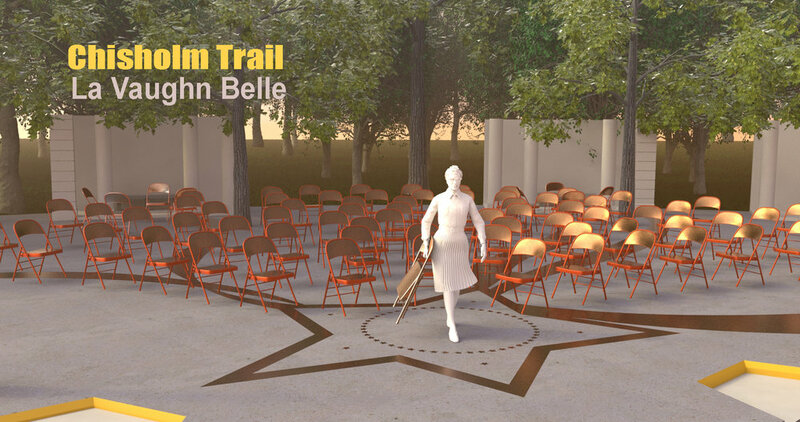 This project attempts to rectify the disparity of women and woman-centered narratives represented in the public space by commissioning a series of 10 monuments honoring women change-makers. The first one is to honor Rep. Shirley Chisholm in Prospect Park. The final selection takes place April 1st. This proposal reinterprets Shirley Chisholm’s famous quote, “If they don’t give you a seat at the table bring a folding chair” and positions it into a larger framework of mobility. This monument invites visitors to not only think about Chisholm’s personal journey from childhood to elderhood, but also the movement of a people and a nation. For what her historic run for the presidency challenges most is our imaginary of what is possible. Wearing a turban and an eagle pin, she steps boldy into a reenvisioned version of the presidential seal. She challenges us to think about how this petite black woman with a Bajan accent marking her immigrant roots, could represent the promise of the United States both literally and symbolically and how her trail -to use her campaign slogan- could “bring U.S. together”. To read more about Belle’s proposal see here.